I suspect “avoiding riots” is one of the better arguments for maintaining a fuel subsidy. Of course, in Egypt this strategy doesn’t seem to be working so well. But some of the other nations that have tried to eliminate their fuel subsidies have experienced mass unrest. Consider, for example, Nigeria, Indonesia, and Venezuela (arguably the world’s worst subsidizer, with more than 8 percent of GDP dedicated to keeping gas prices under ten cents a gallon). Some countries that have tried to cut fuel subsidies have had to backtrack because of this. The Romans had difficulty repealing the grain dole, once the people got used to it. Daniel Kahneman’s Thinking, Fast and Slow said that people are loss averse. Once we have something, we dislike losing it. People enjoying subsidies are [made] much more angry by their removal than [people who would benefit from their removal would be made happy]. Fuel subsidies are a smart policy because the people have decided that’s what they want as their policy. 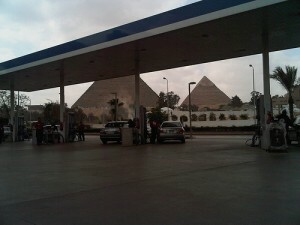 End of story… The Egyptians have decided to spend their money there making [fuel] accessible to all… Everyone thinks they know how everyone else should run their lives. Egyptians clearly know how to demand change in government. We should let them decide for themselves. Reader greenoacean pointed out that fuel price hikes would feed inflation. This is an argument that must be taken seriously; we have seen firsthand in the developed world, in the 1970s, that sudden fuel price spikes can wreck havoc on the economy. Even if all of [Egypt’s] fuel subsidy were suddenly transferred to eliminate poverty, I am highly skeptical that the money would actually go to eliminate poverty. I speculate it would mostly go to corrupted bureaucrats. At least this way if you buy gas, you get something. In conclusion, it is an inane policy but eliminating it could lead to more political unrest and the money would be funneled to more corruption. But in the long run, it would be better. This argument is not lost on the public in many subsidizing nations, who are skeptical that if fuel subsidies are lifted the money will instead subsidize villas in Spain or offshore accounts in the Cayman Islands. As a couple of readers pointed out, dealing with this perception is particularly important in oil-producing nations, which tend to be the heaviest subsidizers; in these countries, cheap gas is intended to show the populace that they are receiving at least some of the benefits from the nation’s oil wealth (although, ironically, many of these nations, such as Iran and Nigeria, are actually paying retail prices on the world market for the gasoline they are giving away because they lack adequate domestic refining capacity). There is a related argument here that none of you mentioned; even if governments are not dishonest, administering a fuel subsidy is comparatively simple, while something like making direct welfare payments to legions of poor individuals, or undertaking big infrastructure projects, is not. So even an honest government in the developing world might see fuel subsidies as a reasonably practical, if imperfect, method of channeling money to the poor. People become more familiar with cultures other than their own. It is easier for inventors to collaborate (I think there has been research showing that people who work in dense cities are more productive because it is easier for them to have face-to-face interaction with people in related fields). As long as the public reaps some benefit from the inventions, a positive surplus. reated a positive externality for all the other bar patrons. This argument is a worthy one, and in my opinion it is one that is understudied in the transportation field, where overwhelmingly the focus is typically on transportation’s external costs (like pollution) and not on its external benefits. Even I have to admit that in this blog I’ve harped far more on transportation’s negative externalities than its positive ones, and I consider myself much better disposed towards travel and mobility than many people in my field. To make this case, you have to keep in mind here that the external benefits must be kept separate from internal ones. So inventors who get rich thanks to in person meetings should pay for their own travel, but if other firms use their ideas without paying for them, society might have some interest in paying for the inventors’ gas. Good point, Jeff. Clearly your employment of your famous wit isn’t restricted to the lucky people who sit next to you in bars, and for sharing it you get a free piece of swag. Consider this a subsidy toward paying your internet bill, thus compensating you for the external benefits of your post to the Freakonomics readership. So next post, I’ll address why the problems raised here are overblown, why fuel subsidies are anyway a poor way to address them, and how we could implement subsidy reform without bankrupting the poor or getting the presidential palace burned to the ground. As for Jeff's argument, it's witty yes, but also wrong. When we subsidize fuel, we also subsidize suburbanization and automobile or (as in Indonesia) motorbike-oriented development patterns. The need for cars to reach people begets the need for more space to accommodate those cars (as anyone who has seen Jakarta's traffic problems will attest to) and this pushes people further apart, meaning that people meet and collaborate LESS as reaching others becomes more difficult and meeting people serendipitously becomes increasingly rare. Also, I just got back yesterday from a few months working with an anti-corruption NGO in Indonesia, a country with not only a subsidy but a very tight price control on fuel. Essentially all gas stations are state-owned and prices are state-mandated. When the prices go up, the government rolls out a program called BLSM which transfers money to the poor to help with the new prices (they've done this a few times now). There are a number of problems with the way that BLSM (among other anti-poverty programs in Indonesia) are dolled out, the least of which is incredibly poor data, collected only every 5 years, that leads to the wrong people getting the transfer payments. The corruption in Indonesia is what really kills these programs, in some administrative areas local capture takes over half of the federal transfer payments according to research from the NGO I was working with has found. you mention how abrupt cancelation of fuel subsidies would provoke unrest and how that is the reason they should be kept. 2) giving the poor vouchers to buy cheaper fuel. (e.g. a debit card of some sort that covers a part of the price of gas). divide and conquer. first the middle class would lose this privilege, and it would be hard for them to mobilize the poor because of the middle class' predicament. after a while you can reduce the subsidies for the poor by either employing the method in point 1) or by abolishing eligibility for different classes of the poor one by one. granted, the second method requires some administrative capacity on the part of the government. true. however, even if you stop at 'fuel stamps' you would still reduce the number of people who would consume this subsidized fuel. in the article it is mentioned that the middle class is the major beneficiary of this policy. with 'fuel stamps' you would at least cut the middle class off from subsidies. While Jeff's argument sounds plausible on the surface, I suggest that a bit of thought will find numerous flaws. While some inventors may profit from transportation-facilitated face-to-face collaboration, my own experience is that many others lose useful thinking/working time because they're driving places (or flying to meetings, etc) instead. In addition, those face-to-face meetings tend to be dominated by a few loudmouths, who use persistence & volume to talk down the perhaps more useful ideas of those of us who have better manners. I would also suggest that (since this is an economics blog), a future post might address greenoacean's claim that "fuel price hikes would feed inflation", by pointing out the difference between price changes due to supply & demand factors, and inflation created by dilution of the money supply. Also, I was around in the 1970s (though young), and if memory serves the economy was already in pretty bad shape before the Arab oil embargo. "Why does removing these subsidies bring people into the streets, despite the fact that the benefits of the policy flow disproportionately to the economically well-off?" Because they don't care if most benefits flow to the well off, as long as some of those benefits flow to them. Most people don't have the obsession with inequality that academics do, and in many (most?) cultures, this type of inequality is assumed in any case. You should have stopped with Dave's comment, because he's right. You're overthinking this one. I lived in Venezuela for two years in the early 1980's and saw this firsthand. My perception is that the subsidy was perceived as a not-for-profit distribution of a natural resource. Granted it could have been sold abroad. But the inexpensive gasoline was seen as a sort of "profit sharing". And of course the cash generated by the international sales of petroleum definitely did not get into the pockets of the average person in Caracas. On that level there was a great deal of corruption. In contrast the domestic sale of gasoline seemed like it was simply a reward for living in the country. Anyone with a motorcycle could benefit. Compare that with other subsidies where the government would have to purchase food and coffee abroad. And these were things that could have been grown domestically. The price of a cup of coffee was very low, as was bread. The government mandated sale prices meant that it was better for landowners to allow farmland sit fallow rather than grow wheat, or coffee beans, etc. In theory everything should work out in the wash with the poor benefiting. In practise my middle class friends try to get cars with the smallest engines (tax calculation is based on engine size) but delivering the best performance. That is something the Germans do very well, especially VW. Very simple in the case of Nigeria - corruption. Removal of the fuel subsidy should free up more money for government to do other projects, right? Well wrong in Nigeria. More money is created for the lootacracy to divide among themselves. Fuel subsidy is/was the only avenue for government to at least provide some service to the people as the government remains unable to provide the basic amenities - power, water etc. 1) People have made long term decisions assuming the subsidy will be in place like getting a car with poor millage or living in a location with poor transit. Businesses may have long term contracts that make similar assumptions about fuel prices. 2) The fuel subsidy may be used instead of spending on public transport, which Cairo seems to completely lack due to its world leading traffic jams. Imagine if New York City decided to close down the heavily subsidized subway system. I didn't see much on the obvious benefit - cheap fuel and cheap transportation allow for the cheap and efficient movement of resources. People can take jobs farther away from home; food and goods can be shipped greater distances; goods can be exported more inexpensively, etc. Inexpensive fuel can help spur economic development that otherwise may be stifled due to high costs of transporting human and physical resources. Additionally, assuming most of the tax dollars used to pay for subsidies come from the rich and the benefit of cheap fuel is conveyed to all, there is a social benefit from this wealth distribution that otherwise might not exist. Here's the real benefit of fuel subsidies, and similar programs: They give economists topics for research. I mean, duh! How could somebody writing on the Freakonomics blog miss that? Aw great, pleased to see my comment quoted here, thanks! "Because the government was offering such a high price, farmers significantly increased production. Huge amounts of often poor-quality rice were also smuggled in from Cambodia, to be passed off as home-grown. Thailand is now sitting on a rice mountain, which it cannot sell without incurring a loss that could be more than $10bn at today's prices. The potential cost of the scheme has even prompted warnings from international investors, yet Bangkok backtracked on a promise to reduce the price this year after protests by farmers." Not sure if this is the right place to post this, but I think it's somehow relevant. Several weeks ago, I went to Ecuador for a wedding and vacation. The nominal distance between Banos (a little touristy town by the foothills of a volcano) to Quito (the capital), is around 174KM/109 Miles. Now, normal tourist will hire a taxi/van for this 2.5 hours ride for roughly $40/person. I took the laymen's bus home and it costs $3 and the ride was 4 hours long. Why the huge price difference? The bus wasn't exactly luxurious or big, and fits roughly 40 people and each trip will make the bus company $120. So I wonder, a taxi that fits 4 makes $160 and a bus that fits 40 makes $120 for the same trip, thus I'm pretty sure the bus service was somehow subsidized by the ministry of tourism. The interesting question is the why would a bus take 60% more time for a same trip? and not make more money? Observation: The bus take a different route going back to the capital, it makes numerous stops along the hilly villages and pick up local villagers. Probably charge them 10cents to 25cents, and the local villagers don't mind standing, it's just a quick trip between towns. This seems to be a very effective system because it solves the farmers' transportation problem and also self-subsidize the running costs of the bus. These buses leave the capital or the tourist town every hour, and there were 3-4 competing bus companies that embark on different times, almost creating a subway like schedule for local villagers. The positive externalities of the system is quite significant. Any thoughts? « Previous PostWhat Kind of Beer Is Most Likely to Land You in the E.R.? Next Post »Do Recessions Increase Productivity?